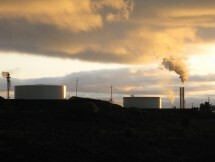 California is not on track to meet its ambitious greenhouse gas reduction goals, according to a study from Lawrence Berkeley National Laboratory. The report, released on Monday, found that California's current energy policies have put the state on track to meet its 2020 target, which is to bring greenhouse gas emissions down to 1990 levels. But without adopting more aggressive tactics, the state will not meet its 2050 goal to reduce emissions by 80 percent from 1990 levels. "The set of policies that we have -- the renewable portfolio standard, the low-carbon fuel standard, vehicle efficiencies, zero net energy buildings, more efficient appliance standard, et cetera et cetera -- are all very helpful," said Berkeley Lab scientist Jeffery Greenblatt, who led the study. But, he said, taken by themselves, these policies will not get the state to its long-term emissions goals. "We're going to have to develop some additional policies to get us all the way to the 2050 target and we're going to have to invest in more technology R&D in order to have those lower-carbon technologies available." Greenblatt recommended that the state invest in biofuels, derive 100 percent of its energy from renewable sources and develop more energy storage. Storage will become especially important as more and more power is acquired from fluctuating, intermittent sources like wind and solar. The California Air Resources Board, the agency charged with implementing California's emissions goals, acknowledged the gap between current policy and long-term targets. "We agree that there's more that needs to be done," said Dave Clegern of the Air Board. He said that the state has been focused on meeting the 2020 goals, but now officials are drafting a new plan to help guide future energy policy. "It's the first one to really look beyond 2020," he said. That plan is expected to be completed by March of next year.